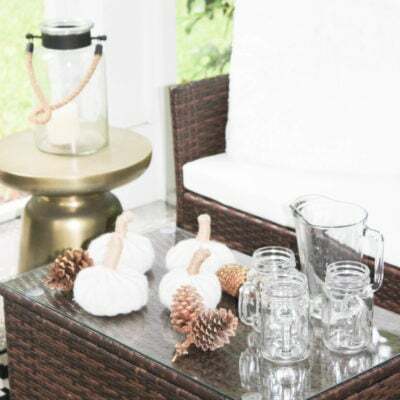 If you like to style you home with DIY beach decor. 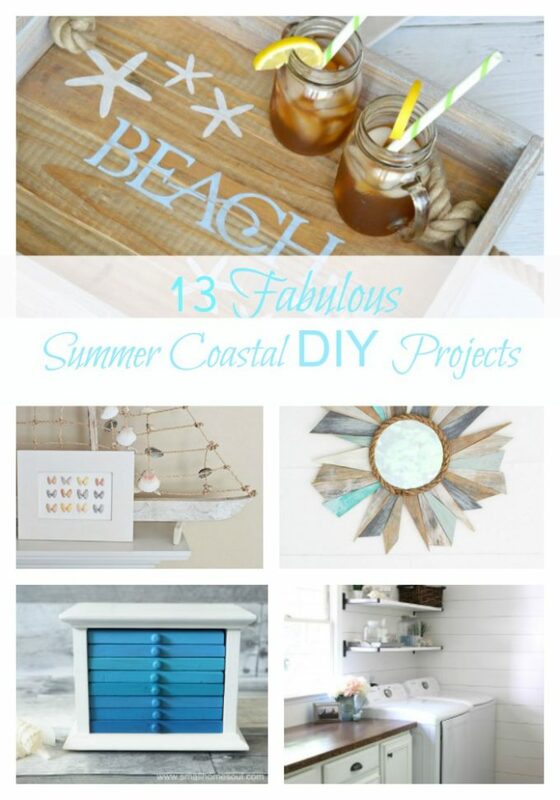 I have lots of inspiration on how decorate your home with 13 coastal diy projects. I am in love with H2OBungalow, coastal rope crab serving tray. 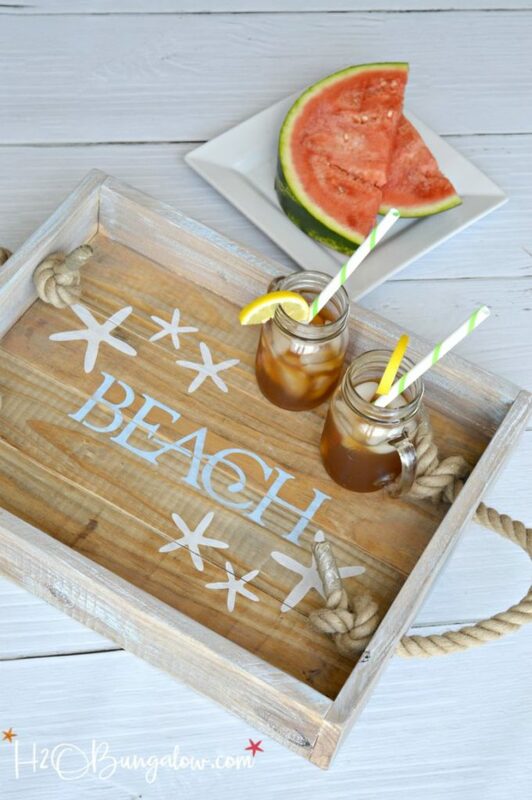 This tray is perfect for any beach party. I love the thick rope which gives a very nautical beach decor feel to any space. 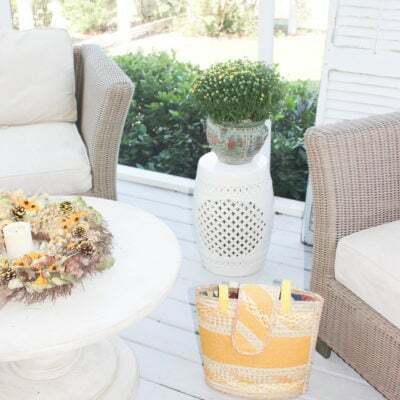 If you love a warm cottage look Virginia Sweet Pea has done a beautiful job in decorating for summer with vintage beach decor. 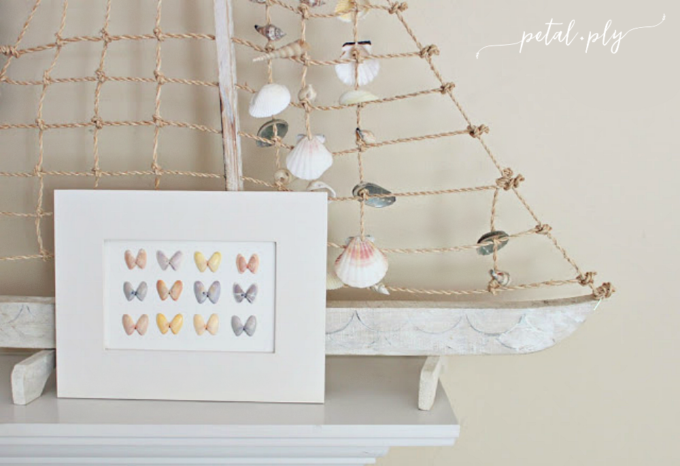 Dazzle While Frazzled made this easy paint chip beach art which is absolutely cute with the gold frames. 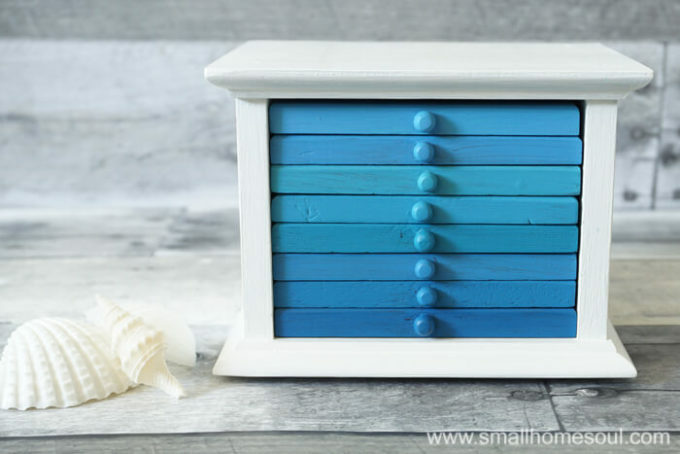 This would look so good in my small bathroom or perfect for a coastal bedroom decor. 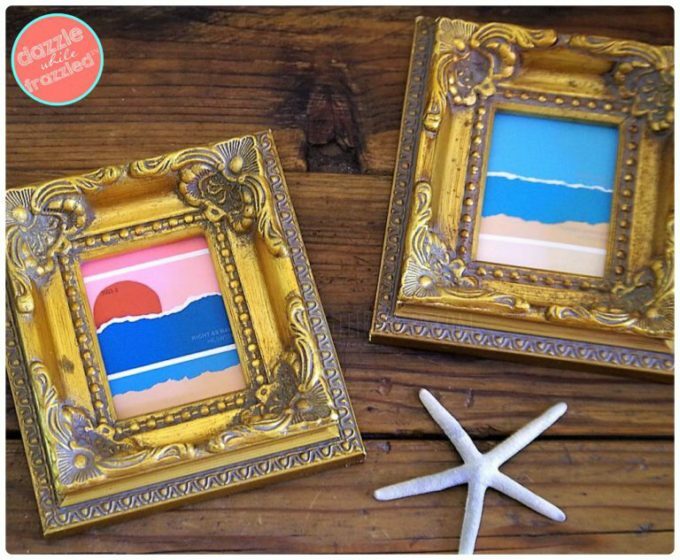 I love Small Home Soul’s coastal drink coaster makeover. 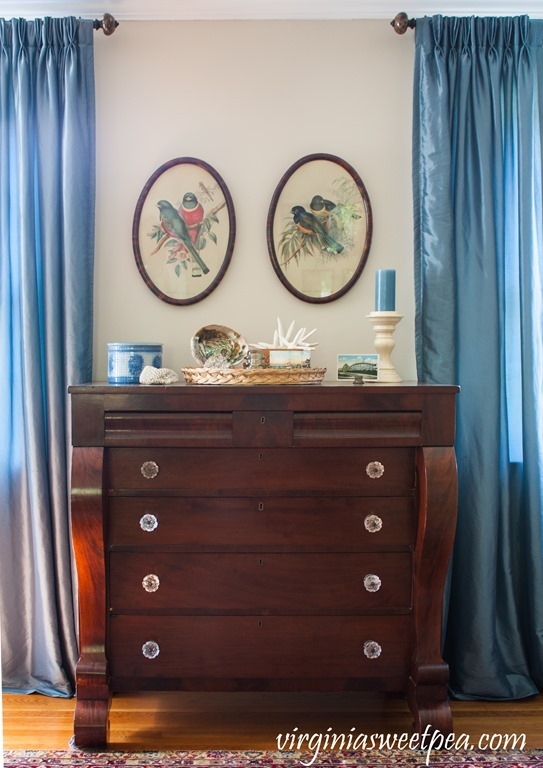 She took an outdated 70’s look into a stylish updated coastal design. Debra from Shoppe No. 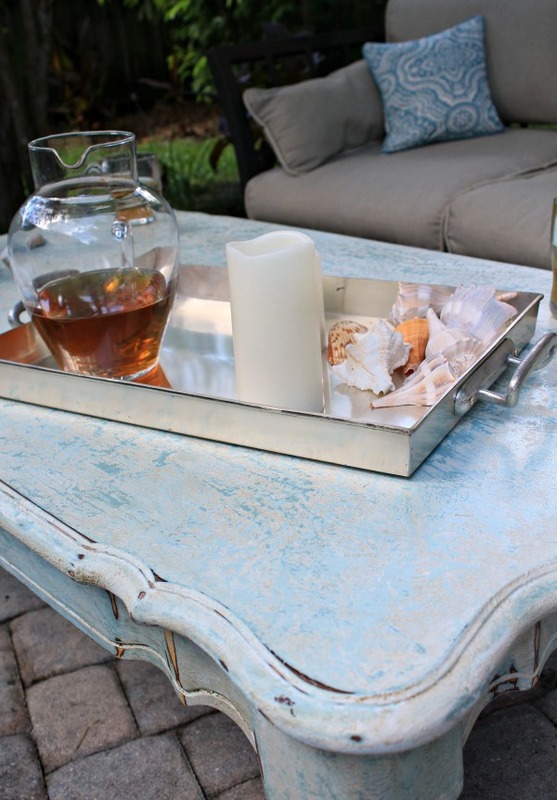 5 did an amazing job in distressing this table with a gorgeous shade of blue perfect for any beach makeover. 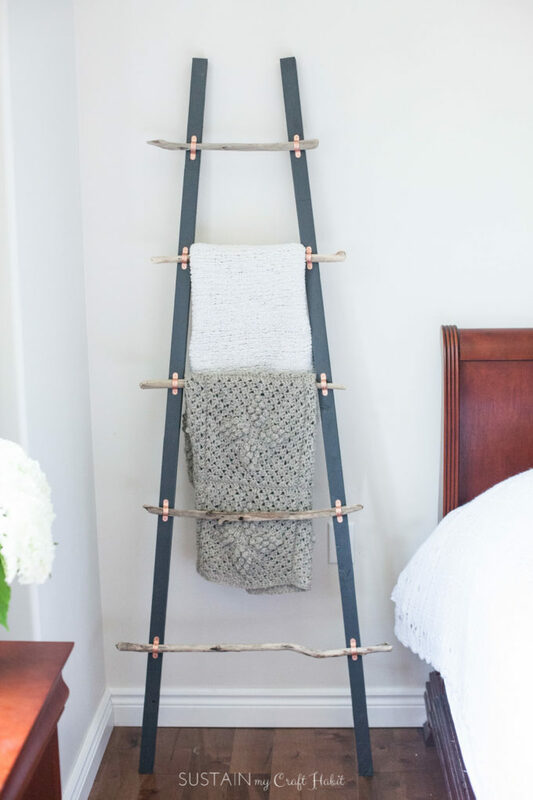 I have a thing for ladders and Sustain My Craft Habit created a blanke ladder with driftwood is super pretty for any guest room. Up to Date Interiors created this beautiful seashell door hanging! 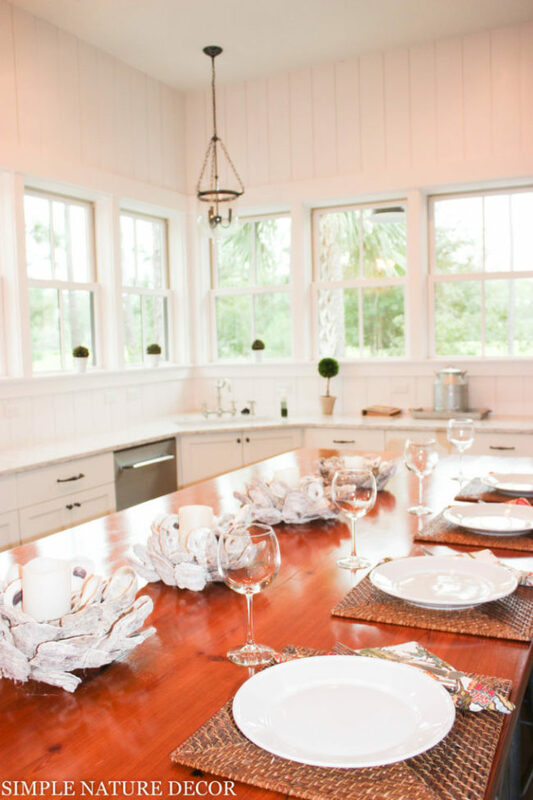 This is my favorite coastal project I did with Oyster shells and created this candle holder. I love working with oysters it’s probably my favorite of all the coastal DIY I have done. Nothing can be prettier that a simple shell art work, so delicate in nature and perfect on top of a mantle by Petal & Ply. 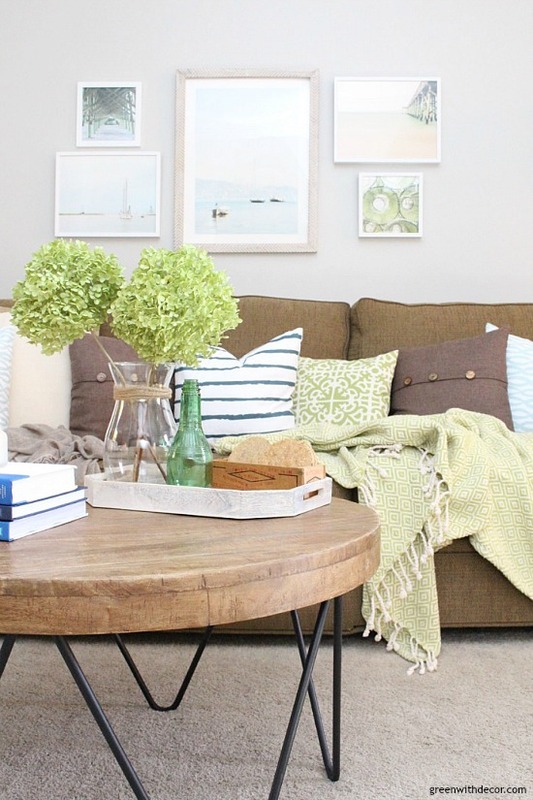 The coastal rustic living room reveal by Green By Decor has a warm feel! Makes me want to cuddle up with a good book. 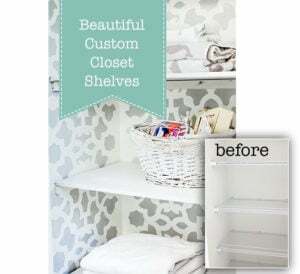 Artsy Chicks Rule created this pretty coastal farmhouse laundry room. I be doing laundry all day if my laundry room looked like this. Sit and relax with a cup of coffee in this coastal kitchen. 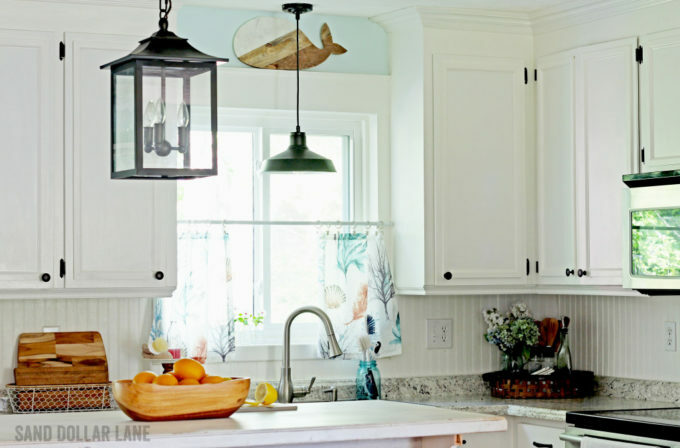 Sand Dollar Lane created a beautiful coastal farmhouse kitchen remodel. 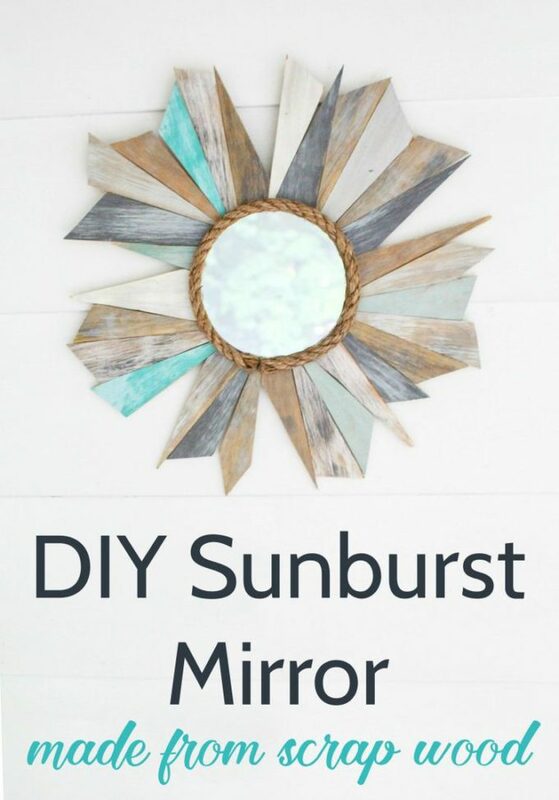 I love wood for coastal decor and Lovely Etc talented endeavors created this DIY beachy sunburst mirror. I like to thank Wendy from H2OBungalow for organizing this fun round up! Subscribe to get new posts by email and get the printable calendar, too! I can’t get enough of looking at all of these beautiful projects. 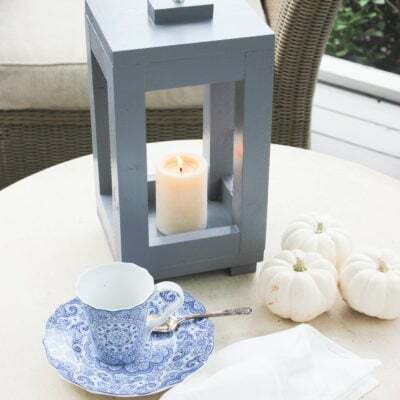 Love the candle holders. ME too! Love them all! I love your oyster shell candleholders! We have oysters growing like crazy on our dock piling. 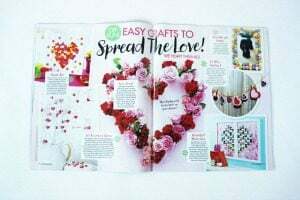 I’ll have to go grab some and create a few. 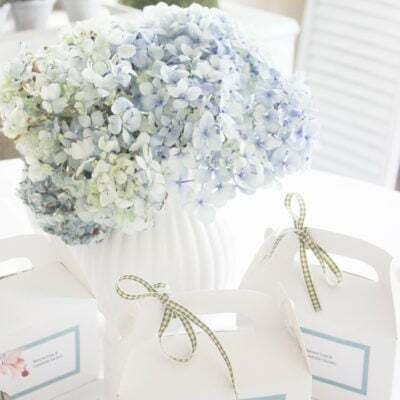 They’d be beautiful for an outdoor tablescape! Thanks so much for joining in on the coastal DIY project hop! Thanks Wendi, I truly enjoyed being in this with you and everyone else. Thanks for a great job! Thank you so much Nancy! Have a great weekend! Neat list of projects – saw coastal in your email and had to click over. It’s so calming and there are days when I hear the breeze of water calling. The tray and mirror were my favorites on this one. Enjoy a great weekend Maria! Thanks my dear friend! I appreciate the love! Have a great week! Love your oyster candle holders. They are are so chic and fantastic! I really want to try my hand at some. These are all cute projects. I really love the serving tray, and the simple shell art. 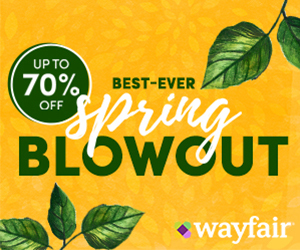 Bringing what's beautiful in nature into your home. 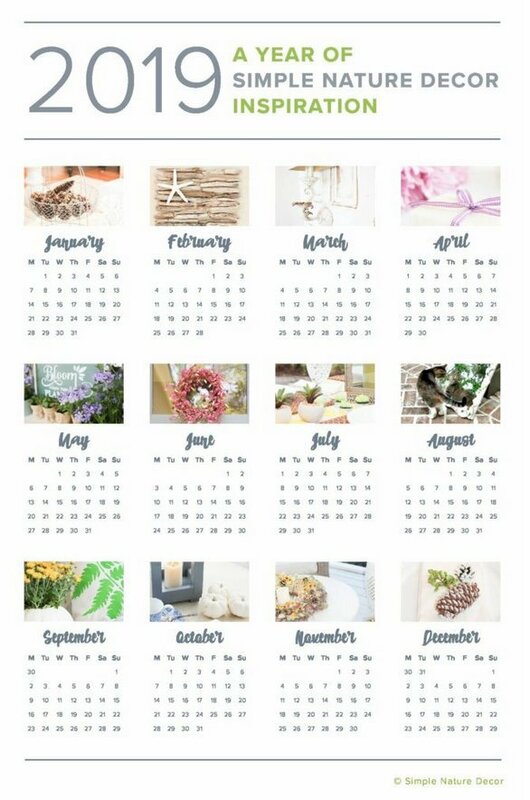 My 2019 printable calendar is included when you subscribe!